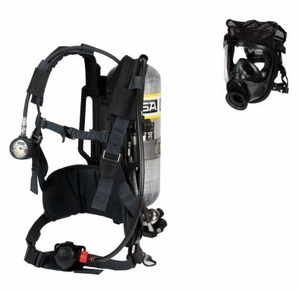 MSA AirHawk® II HP Self Contained Breathing Apparatus includes Advantage® 4000 medium Hycar™ rubber facepiece with polyester net head harness, nylon harness with chest strap, 45 min carbon low profile cylinder and hard case. Lightweight and durable SCBA features pressure-demand apparatus to maintain positive air making it ideal for industrial-hazard applications. Apparatus with easy-release friction buckles has 45" cylinder that operates at 4500 psig. Apparatus featuring detachable components for easy maintenance has ergonomic backplate and harness assembly for comfortable as well as stable wear. It meets NIOSH 42 CFR part 84 standards.